Irctc Online Ticket booking Process before candidate should register into the IRCTC registration at official website. free IRCTC registration with individual account after email verification, which give details of candiates for login purpose. Now on login by entering the website of WWW.irctc.co.in. Where select “play my travel” page, enter from station and To station, Select Date of Journey Date and Select Ticket Type E Ticket or I ticket. Select option “E Ticket”. Click on Submit. After all List of Trains show the number of trains available for that route. After your wish to select train name and the timings option. Then click to know class to get availability of seat and its fare. class means 1A, 2A, 3A, SL, 2s And CC. 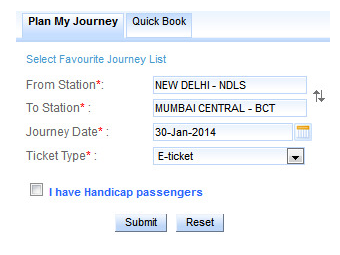 Before booking ticket , you should select “General”, in case “tatkal” select it. To get the fare, click on class available in the selected train under “List of Trains”. It will show fare according to type of class selected. The fare appearing is for a single adult Passenger and the service charges charged by IRCTC. Now ticket booking process, To select the train from the train list, click on the type of class available in the selected train.To book tickets, click on “Book Now” button under availability option. 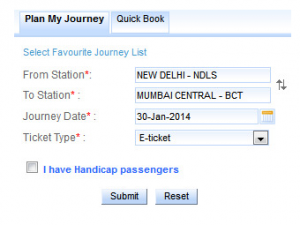 Ticket reservation booking chart page appears; check whether the train name and the station names displayed on the top of the page are same as desired by you. Now on enter your number of paasenger details , incase any childern 5 years below mention. Mention passenger age, gender and berth type, incase of senior citizen mention it. Click “next” option. After successful payment and booking ticket details sends to mobile phone. it shows to TT and say Happy journey.